Here, the black line is the total power generation from every source. This is also the same as for total power consumption, which is slightly lower after minor grid losses are taken into account. The Blue line is all fossil fuelled power generation. The orange line is hydro power generation. The purple line is wind power generation, and the red line is for solar power generation. 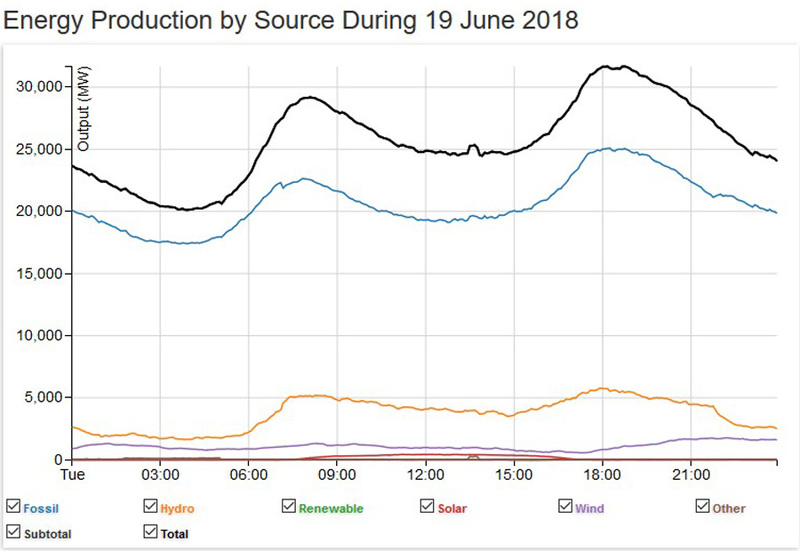 Both of those (exact) figures for total power consumption for the daily minimum and the daily Peak are taken directly from the AEMO site, adding up the totals for each of the five States in this coverage area. Note the slight difference between Total Consumed Power and Total Generated Power. That indicates some of the losses in the grid system. This Image shows just the gap between total power generation from every source and the total power from renewable sources only. 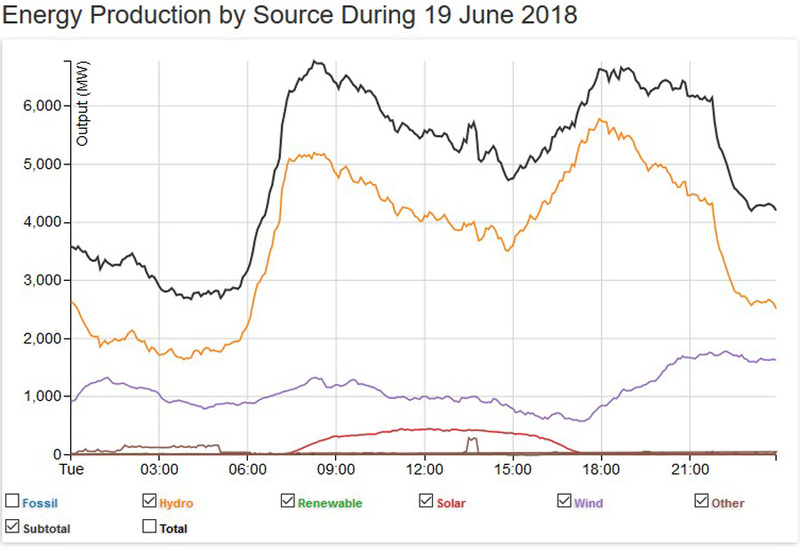 It is the same image as the first image at the top here, only with the fossil fuelled total (the blue line) removed from the graph, As in that top image, it shows Hydro Power, (orange line) wind power, (purple line) and solar power. (red line) What I have then done is added the black line just above those coloured lines and this indicates the Sub Total of power from those three renewable sources only. This is to highlight the gap between the total power generation and the total from renewable sources alone. This image is the same as for the one directly above for all renewable power, only with the total from all sources removed from the graph. As the scale of the left hand vertical axis has now changed, you can better see the detail of all renewable power. 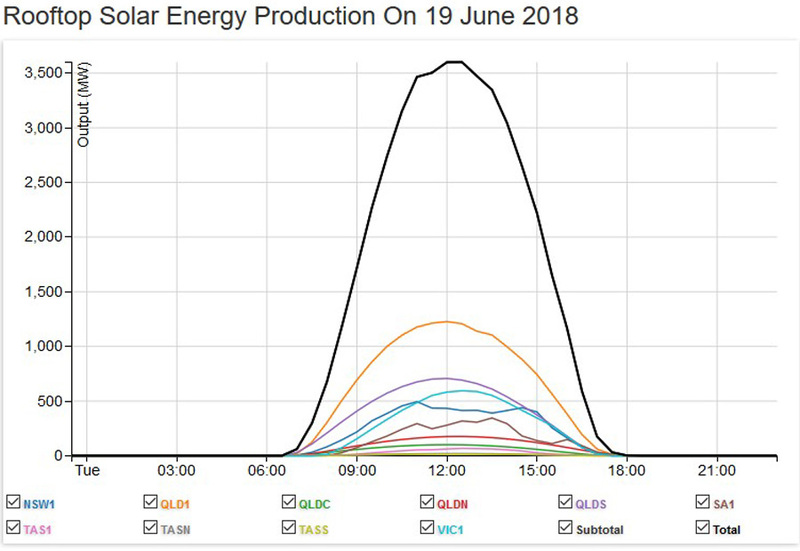 Again, the orange line is for hydro, the purple line is for wind, and the red line is for solar, and the black line is the Sub total for all renewable power. The other colour just showing indicates smaller plants, mostly using biofuels as their fuel source, tiny plants adding up to a very small total and for a short time duration. The total Nameplate for all these wind plants is just under 5225MW. The total Nameplate for all these 16 solar plants is just lower than 1000MW. Finding Averages – On each graph there are 9 time points. Add the total at each time point together, and divide by 9. For coal fired power, I do this on a State by State basis (for the 3 States with coal fired power) and then add the total for each State together. For both solar power averages, I have used the average for a (half) Sine Wave which is 0.637 of the Peak value. The total percentages for coal fired power, natural gas fired power and all renewables adds up to 100%. It was another cold working week day, and power consumption and generation was high again. 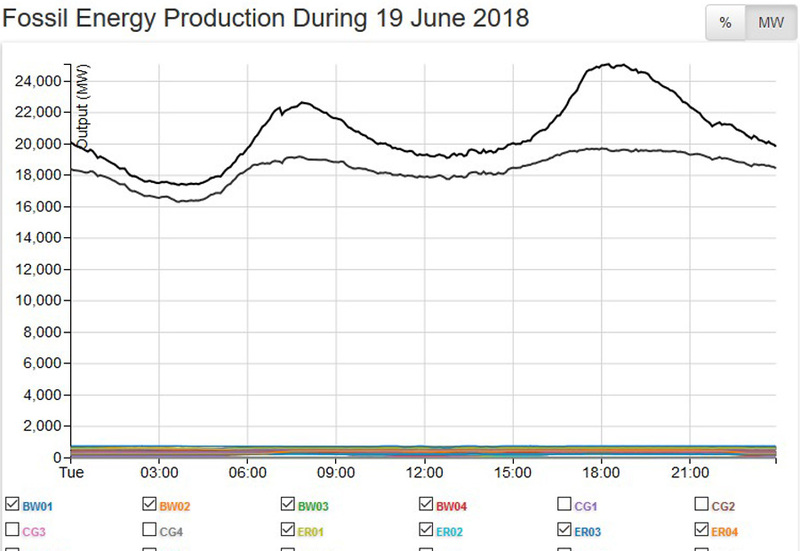 Of most note here is that minimum power consumption figure for this day, and while the year round average is 18000MW, on this morning at 4AM, it was 19790MW, and that’s 1240MW higher than for yesterday. The peak power consumption at 5.30/6PM was only 240MW higher, and power generation was higher to reflect those rises, most notably at 4AM, and at that time coal fired power was 1100MW higher, so it seems that when extra power is required for an increase in consumption, coal fired power is the go-to source for that. The average power generation of 25500MW across the whole day was 300MW higher than for yesterday. Note on that top image there how the shape of the Load Curve for ALL fossil fuels (the blue line) follows the Load Curve for total power generation (the top black line) closely, with the two peaks and the dip in the middle. The average power generation for coal fired power of 18500MW was 300MW higher than for the day before, and that rise fully covers the rise in the overall average for all power generation sources. 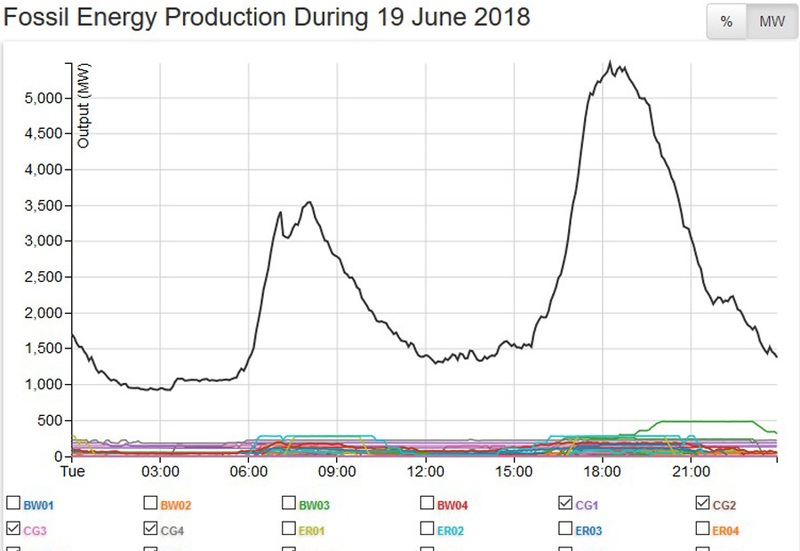 The average for natural gas fired power was 100MW lower, and that fall was covered by hydro, which was an average of 40MW higher and wind power which was an average of 60MW higher, with solar power remaining the same as for the day before, albeit only 100MW in total for solar power, barely 0.4% of all power being generated. 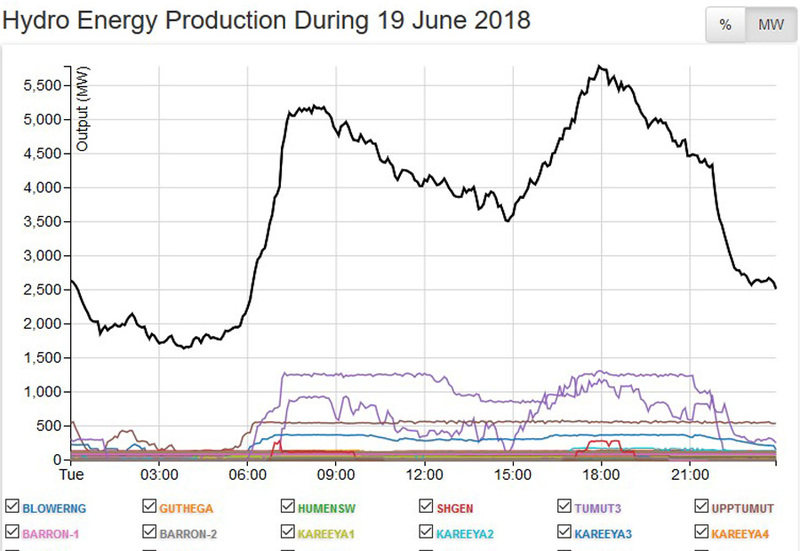 Again wind power was low at the peak power time, delivering only 850MW when 32200MW was required, so wind was delivering only 2.6% of what was needed at that time. That average of 1130MW across the day for wind power is at a Capacity Factor of 21.6%. 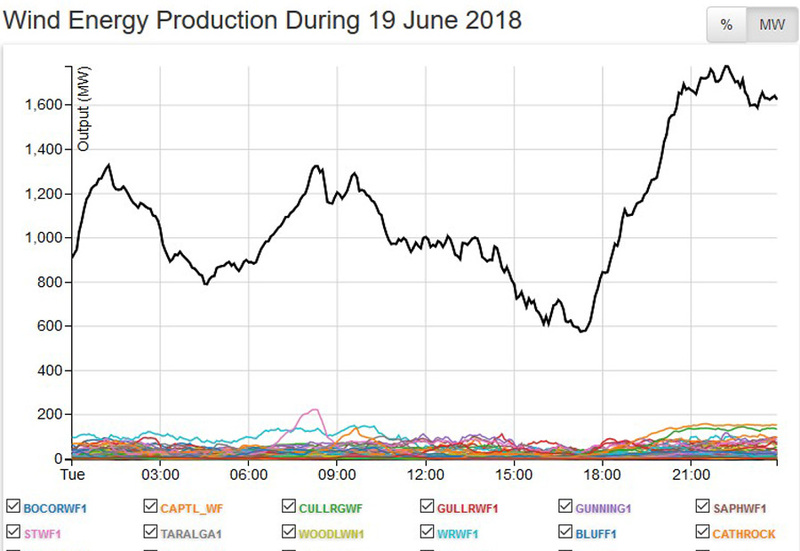 Again we see that when ‘real’ power in large amounts is needed, the one source that comes to the fore is coal fired power, and just look at this for a moment. At that time of peak power consumption coal fired power was generating 19700MW. The total Nameplate for all 48 Units at the 16 power plants is 23000MW. 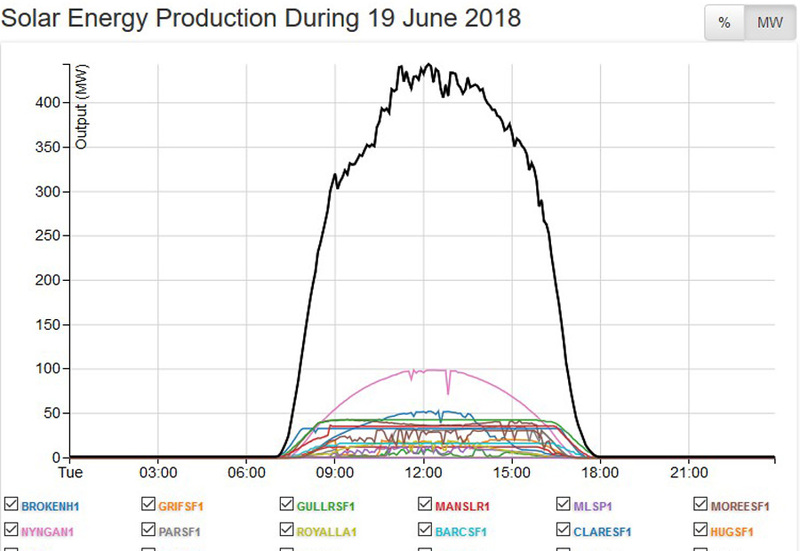 Four of those Units are currently offline, and because of that, it takes the current operational Nameplate down to 21000MW. So, coal fired power was generating 19700MW in total, from that existing Nameplate of 21000MW. So, coal fired power was delivering its power at a Capacity Factor at that time of 93.8%. Wind power was delivering its power at that same time at a Capacity Factor of 16.3%. 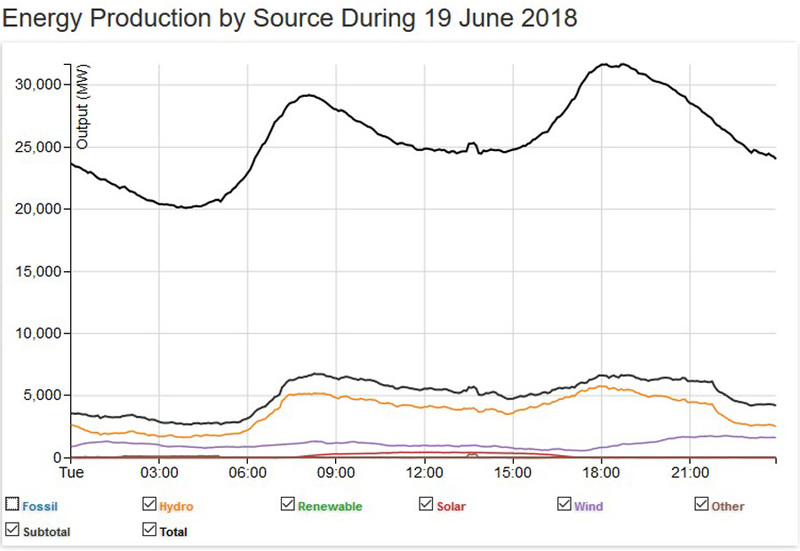 At that time of peak power consumption, coal fired power was delivering 23 times more than wind power, supplying 62% of the total needed, and wind power was delivering 2.6% of that same total of 32000MW. It seems coal fired power is more important than it is given credit for. ← Australian Media – Wrong, Michelle. Can We Discuss Your ABC?